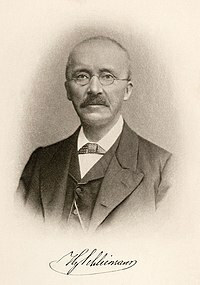 Heinrich Schliemann (German: [ˈʃliːman]; 6 Januar 1822 – 26 December 1890) wis a German businessman an a pioneer in the field o airchaeology. He wis an advocate o the historicity o places mentioned in the wirks o Homer an airchaeological excavator o Hissarlik, nou presumed tae be the steid o Troy, alang wi the Mycenaean steids Mycenae an Tiryns. This page wis last eeditit on 28 Mairch 2017, at 05:13.